When baby Everly was just one day old, she was tasked with a very important job. 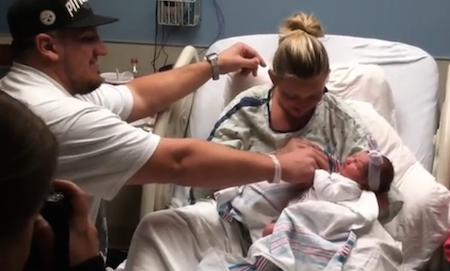 Everly’s dad, Chad, worked secretly to give the mother of his child, Lauren, the surprise for life – but first, she needed to realize the surprise was written on Everly’s adorable onesie. Lauren had no idea what was coming just 24 hours after delivering her baby girl. Can you guess what the surprise is? Watch the video and see!